Family and friends may call at the Amos Carvelli Funeral Home, 201 Edison Street, Nutter Fort, WV on Thursday, January 31, 2019 from 2:00 to 8:00 p.m. There will be a prayer service at 7:30 p.m. to conclude the visitation. Family and friends will meet at 9:00 a.m. on Friday, February 1, 2019 at All Saints Catholic Church, 317 East Main Street, Bridgeport, WV where a Mass of Christian Burial will be celebrated at 10:00 a.m. with Father Chris Turner as Celebrant. Interment will follow at Floral Hills Memorial Gardens. Samuel “Sam “Anthony Moscar, age 80, passed away at home on January 28, 2019, after a courageous and long fight with his health. Sam was born in Clarksburg, WV, on January 9, 1939. He was the son of the late Anthony and Vincenza (Ficence) Barberio Moscar. He is survived by his wife of 50 years, Carol Fratz Moscar. Also surviving are his sister, Leonora Moscar Destito, and his children, Daniel Anthony Moscar, his wife Jennifer Freeland Moscar of Richmond Virginia, Bianca Barberio Moscar King and her husband Randy King of Hilton Head Island, SC and Heather Hartley Moscar Napoleon of Houston, TX. In addition, he is survived by five grandchildren, Samara Kendrick Loar and husband Alex, Gabriel Michael Napoleon, Edison Joy Moscar, Giana Vincenza King and Katon Caroline Moscar. He is also survived by his niece, Toni DeMary McMillion and her husband Mark of Clarksburg, Samuel Richard DeMary and his wife Beckie of Salisbury, NC and Battista Destito and his wife Jennifer of Clarksburg and their children. Sam was a gentle, kind and loving man, with a special relationship to his cousin, Julia Messe Cutright and her husband Bill as well as having the honor of being Godfather to eleven children. He was the father of former exchange students, Zuzana Vesela, Giordana Ribero, Thomas Reichau and Valerio Bruti. In addition to his parents, he was preceded in death by his sister and brother-in-law, Richard and Mary Rose Moscar DeMary; his brother-in-law Cary Fratz and brother-in-law Saverio Destito. Sam graduated from R-W High School in 1957 and Salem College with his degree in Medical Technology. He went on for Master’s level work to the University of Michigan and worked for Union Protestant Hospital as a Medical Technologist, Head of the Chemistry Department. He went to work at the Veteran’s Administration Hospital as a Supervisor of the laboratory, then retired as Assistant to the Chief of Staff of Ambulatory Care. He retired from the VA Hospital in 1997. His retirement job was as a cook for Mother Gooseland. In addition, he was co-owner of DeCarDe Catering and loved cooking and teaching his grandchildren to cook. Sam was a member of the Clarksburg Kennel Club and showed Old English Sheepdogs in Conformation. More recently, Sam adopted Angel and Mya from the Harrison County Humane Society. 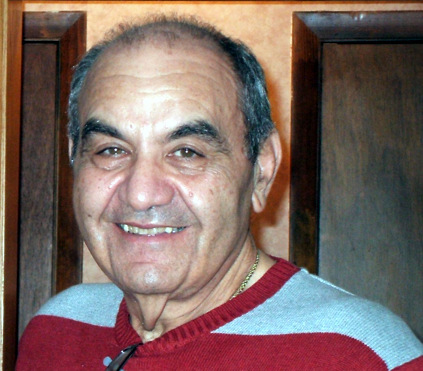 Sam was one of the original men who helped establish soccer in this area with Lydia Mingyar, coached a Bridgeport youth soccer team and became a referee. He was active with the Italian Heritage Festival in presenting Italian Cooking classes. He is a member of the Knights of Columbus and a member of All Saints parish, where he helped with the Lenten dinners served at the church. In lieu of flowers, please make contributions, in his name, to the Harrison County Humane Society or All Saints Catholic Church.